Sacramento, CA: The fate of a common agricultural pesticide linked to irreversible brain damage in young children remains mired in state bureaucracy, in a process that could take up to three more years to resolve. 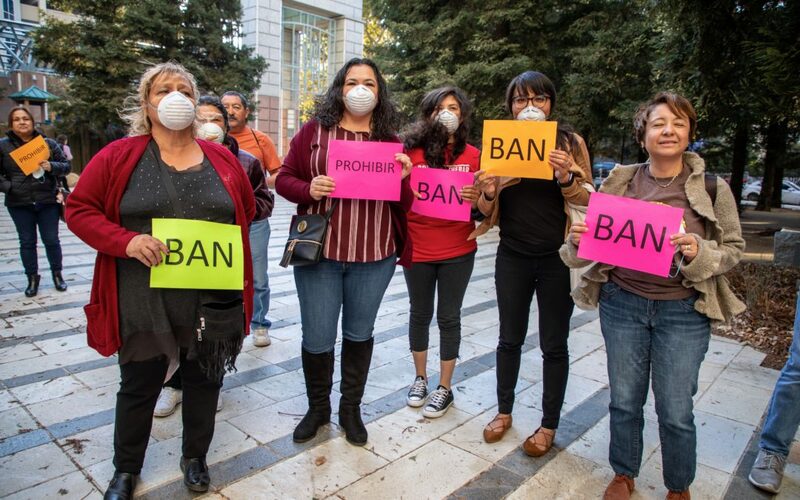 At a hearing Thursday in Sacramento to consider listing the neurotoxic pesticide chlorpyrifos as a Toxic Air Contaminant, emotions ran high as residents of agricultural communities showed up with a simple demand: Ban it now. A proposed federal ban of chlorpyrifos was reversed by the Trump Administration’s EPA last year. Since then, the California Department of Pesticide Regulation (DPR) has been conducting its own review of the science, and in July announced its conclusion that current levels of exposure pose a risk of brain harm to babies and children. But what comes next is less clear, as the state continues a painstaking process of review and decision-making that many scientists and advocates decry as needless stalling on one of most toxic and most thoroughly reviewed pesticides still used in California. Once chlorpyrifos is listed as a Toxic Air Contaminant, the Department of Pesticide Regulation must come up with additional measures to protect public health in consultation with other state and local agencies, including the Office of Environmental Health Hazard Assessment and the California Air Resources Board. DPR then has 2 years to adopt control measures, which could include anything from increased buffer zones to an outright ban. A final decision is expected in 2021. But advocates pushed back against this timeline, noting that the Toxic Air Contaminant regulatory process requires the Department to immediately cancel registrations of a chemical that “demonstrated serious uncontrollable adverse effects”; that is “detrimental … to the public health and safety” even when used properly; that causes greater detriment to the environment than the benefit received; or when there are alternatives that are less destructive to the environment. Among the coalition of more than 100 organizations calling for immediate cancellation are the California School Employees Association, California Nurses Association, and United Farm Workers of America. Their demand was echoed by a dozen state legislators who signed on to a letter authored by Assemblymember Laura Friedman (D-Glendale) calling for an immediate ban. “After a year of further investigation, three different California scientific bodies confirmed what EPA officials previously found: chlorpyrifos is too harmful to use in any amount. The pesticide is found in our air, water and food, and impacts children’s developing brains. Legislators agree with California families: we can’t wait any longer. It’s time for us to suspend or ban it,” said Asm. Friedman. Californians for Pesticide Reform is a diverse, statewide coalition of over 190 member groups working to strengthen pesticide policies in California to protect public health and the environment. Member groups include public and children’s health advocates, clean air and water groups, health practitioners, environmental justice groups, labor, education, farmers and sustainable agriculture advocates from across the state.